Alan heads to EA's Redwood Shores HQ to get a behind-the-scenes look at the confusingly-titled Battlefield 1. While news that EA studio DICE is creating a new Battlefield shooter is hardly shocking, exactly what direction the developer will go this time is definitely the kind of question that sets the Internet aflutter. This year was no different, with digital sleuths on Reddit and NeoGAF probing every source they could get their grubby mitts on in an attempt to beat the publisher to its own reveal. Those efforts were partially successful, uncovering leaks from Microsoft as well as from unscrupulous retail employees, and so Battlefield 1’s name and box art surfaced early. So what is Battlefield 1? By now, you’ve seen the trailer. Invited to EA’s reveal event in San Francisco, I also got to see some additional material and interact with a panel that featured developers, community managers, and a member of a group referred to as “game changers”. It was inferred that the latter was an EA representative who got to go hands-on with the game early and provide feedback during its formative stages of development. In this case, the Game Changer member present was poolshark – a moderator from the official Battlefield forums. The fifteenth Battlefield game, Battlefield 1 uses its confusingly out-of-order moniker not to signal that it’s set in World War I (which it is), but instead to make the statement that World War I represents the “true dawn” of Battlefield-style warfare. This seems directly at odds with people’s preconceived notions of what WWI was about, which mostly centre on trench warfare and simplistic weaponry. 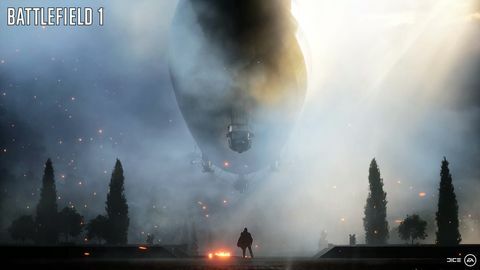 According to Daniel Berlin, lead world designer at DICE, WWI – which he describes as the “most technically divergent” war – represents a perfect fit for Battlefield gameplay. That’s because warfare in the Great War (1914-1918) started simple, but ended up being a race to find the ultimate killing machine, and thus included tank warfare, biplanes, bombers, and even battleships. According to the panel, this combination of technologies will lead to an interesting mix of methodologies on the battlefield. You will literally “bring a horse to a tank fight”, according to very funny MC and e-sports caster Alex “Goldenboy” Mendez. 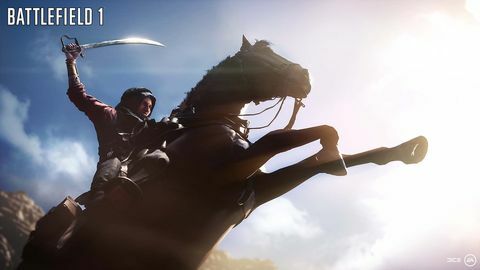 Whether that extends to the potentially controversial ability to strap explosives to your horse and send them on a suicide run is yet to be revealed, but the very fact that such a concept is already being speculated on speaks to the open gameplay that Battlefield is known for. 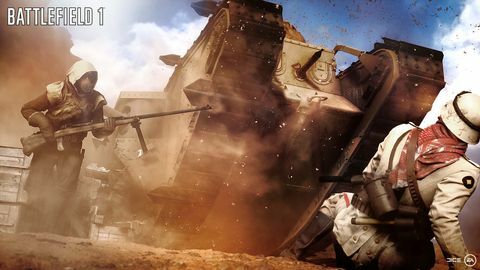 Despite the game’s significant change in era and technology, DICE and EA representatives were quick to reassure us that what they refer to as “Battlefield Moments” are at least as plentiful here as they have been in earlier games. 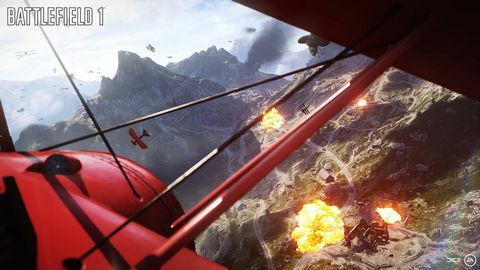 Indeed, in the trailer you can see plenty triplane vs infantry combat, and the usual dogfights, shootouts, and tank rollings will all take place on battlefields with up to 64 players duking it out at once. Battlefield is also less-officially known as a game in which crazy moments can occur, and it’s fun to speculate on the form such moments will take here. Horses on a plane? Horses on a battleship? Horses riding men? These probably aren’t the “Battlefield Moments” EA was referring to, but you could tell all in attendance were already thinking about it. One significant aspect of World War I was the role that hand-to-hand combat played in establishing battlefield supremacy. In order to deliver on that reality, DICE has developed an all-new melee system, complete with a Bayonet Charge move the studio claims will be a core part of the experience in many encounters. Another misconception many have of the First World War is that it pretty much all took place in the mud. DICE is hoping to disperse this misunderstanding and simultaneously deliver more variety than it has in the past by sending players to the Italian Alps, Arabian deserts, and other locales that “we’ve never visited before”, in addition to the expected French towns, beaches, and trenches. Gameplay mechanics were not discussed in much detail, however it was confirmed that players will be able to choose different roles to play: Assault, Medic, Support, and Scout. There are also all-new vehicle-based classes like the Tank Officer and the Pilot. Whether these are specialisations on top of the core four classes or extra classes in their own right wasn’t made clear. 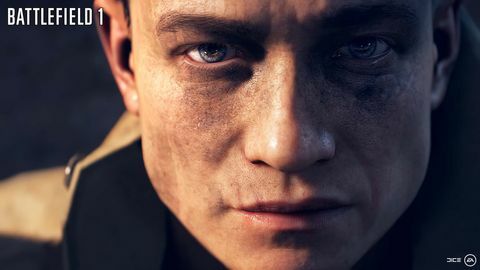 EA claimed that core Battlefield systems like destruction and scale will reach “all new heights” – something the trailer and additional video material shown behind closed doors really focussed on. A brand-new system called Persistent Squads will help players stay together by allowing you to form a group and keep it together across multiple games, potentially eliminating the frustration that can emerge when playing with lone wolves or just plain stupid players on public servers. DICE was quick to say that lone wolf-style play is still supported, it’s just that success in the game will be more reliant on team play than ever before. Unsurprisingly given the early nature of the reveal, there are plenty of things EA is keeping a lid on right now. Single player was confirmed but wasn’t detailed beyond a mention that it would be more of a Battlefield experience: more vehicles, more open-ended gameplay, more player choice and larger environments. We also know that the story will be told from the point of view of a large cast of characters. Whether this extends to the pre-order DLC that’s based on the Harlem Hellfighters is not clear. Whatever the case, the material I viewed at Redwood Shores in San Francisco has me convinced that despite its old-timey setting, Battlefield 1 will likely deliver the pace and energy of recent entries in the franchise. Whether it will manage to deliver a compelling set of Battlefield tools and still stay both respectful and true to the real World War I remains to be seen. Such post-release analysis is something we can all look forward to when Battlefield 1 releases globally on October 21 (October 18, if you buy the early access edition). One thing that hopefully won’t be part of that late October discussion is anger at the diminutive size of the game, though to be fair, the series has never struggled content-wise. But as EA reassured us that Battlefield 1 is huge, containing all-new game modes and levels, the slim spectre of Battlefront gazed down at its non-existent feet, before quietly departing the room by sinking softly through the floor. ◆ Alan travelled to San Francisco courtesy of EA.